My final two days in Taiwan were spent in the company of friends in Taipei – but fortunately I was still able to get out a couple of times to see some birds. The Taipei Botanical Gardens lived up to their reputation as an oasis for birds, with bird life abundant here and many of the birds very tame and obviously well used to people. Not long after entering the park I found my main target – Malayan Night Heron – walking about under some trees. This is a very tricky world bird and, although not too hard to find in Taiwan, is definitely not a bird I would expect to see anywhere else this year. Nearby, a Taiwan Scimitar-Babbler gave the best views I have ever had of this usually skulking species, while a large bush-warbler with a reddish forecrown and chunky bill was what I used to call Korean Bush-Warbler, but is now apparently to be referred to as Manchurian Bush-Warbler, although the taxonomy of the bush-warblers occurring in Taiwan is still the subject of much debate. Photographers clustered on a bridge, where four Taiwan Blue Magpies, many Grey Treepies and an Oriental Magpie-Robin provided some excellent photo opportunities as they squabbled for the food placed out for them. Birding at its easiest, and an excellent chance to show my non-birding girlfriend some of Taiwan’s most attractive birds at very close range. I was surprised to see Oriental Turtle-Dove in this urban lowland setting (in south Taiwan they are mountain birds only), while several Pale Thrushes, Taiwan Barbets and another Malayan Night Heron rounded off a wonderful visit. The next morning, I was up early at a riverside park close to my friend’s house, where I was delighted to chance upon a small flock of Dusky Thrushes on the short turf – a most welcome Taiwan tick. Also here, a pair of Black-collared Starlings (these are rare in south Taiwan) and four Richard’s Pipits. Taiwan tick: Dusky Thrush (total 283). Ferruginous Duck (presumed adult female), Yuanfugang Wetlands Park, Kaohsiung, January 20th. Record shots with hand held camera, taken through a gap in the fence! It was preening constantly, hence why that “extra” white patch is visible on the wing. With Ferruginous Ducks turning up all over Taiwan at the moment it seems, it was about time I found one for myself. At the rather derelict Yuanfugang Wetlands Park on the northern outskirts of Kaohsiung (just off Km 212 on Highway 17), I found what I had been keeping an eye out for. 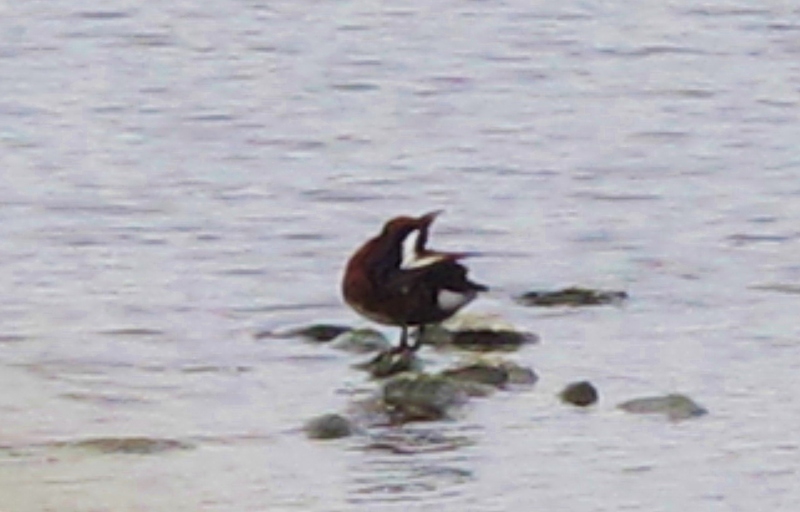 Probably an adult female (based on its dull chestnut plumage and dark eye), this bird was preening on a rocky island. Getting a clear view was fairly difficult as the area is closed off to the public, and a snatched photo through a fence and emergent vegetation was the best I could manage as scoping the bird was impossible. Elsewhere, it was a day of mixed fortunes. I arrived at the Ba Zhang River, on the Tainan/Chiayi border, just as a very large and long-winged adult gull with pale grey upperparts was making a distant exit to the north (it seems that rising water forces the gulls off this river at high tide). My gut feeling told me it was the adult Great Black-headed Gull, and that it wouldn’t be back for a while! Searching elsewhere failed to reveal the bird, but I did see at least three Mongolian Gulls during the day, as well as six Saunders Gulls and three Black-tailed Gulls at the sandbar roost on the Puzi river. I also missed the Hooded Crane – again – near Tainan City, and somewhere deep in Sihcao Reserve I almost ran over a rail that crossed the road in front of me. The latter was either a Slaty-breasted Rail or an Eastern Water Rail, but unfortunately it was little more than a glimpsed silhouette that quickly disappeared into thick cover – which is a shame, as either one of these birds would have been a lifer. I had a bit more luck with the wintering Great Crested Grebe, on the pool just north of road 163 at Xinwen. 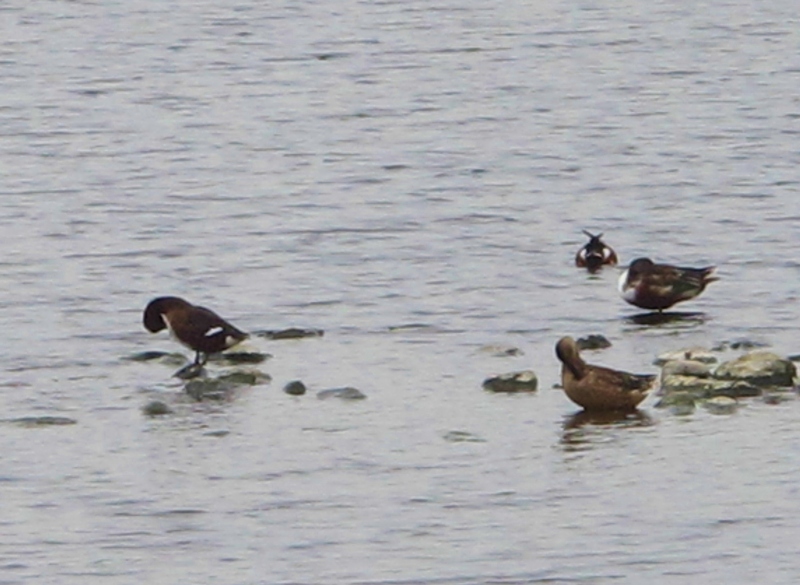 Nearby, six Greater Scaup (four females and two immature males) and 32 Common Pochard were among the Tufted Duck flock. On the pool immediately to the south of the road, there was just one Black-necked Grebe – a big reduction in numbers since my last visit a couple of weeks ago. The area also produced two Ospreys, a Black-shouldered Kite and a Richard’s Pipit, as well as plenty of common wintering birds to look at. Other odds and ends picked up today included four Azure-winged Magpies at Sihcao Fort, Tainan, two Curlew Sandpipers with a large wader roost at Budai, nine Little Terns near the Ba Zhang river, and a lone Pheasant-tailed Jacana at the Yuanfugang Wetlands Park. 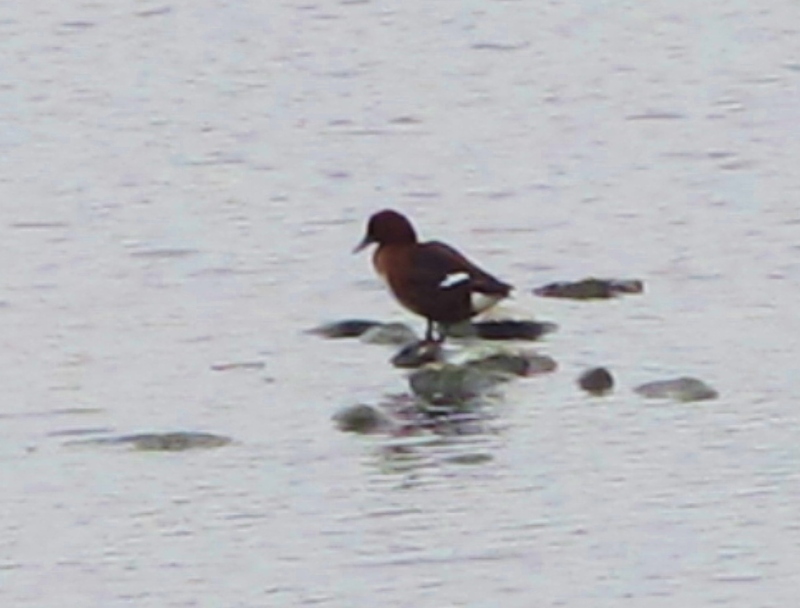 East Asia tick: Ferruginous Duck (total 880). Taiwan tick: Great Crested Grebe (total 282). Pineapple fields at Jiadong – ideal Blue-breasted Quail habitat. It’s impossible to see one among the pineapples, but it is sometimes possible to flush one from the long grass at the edge of the pathways. 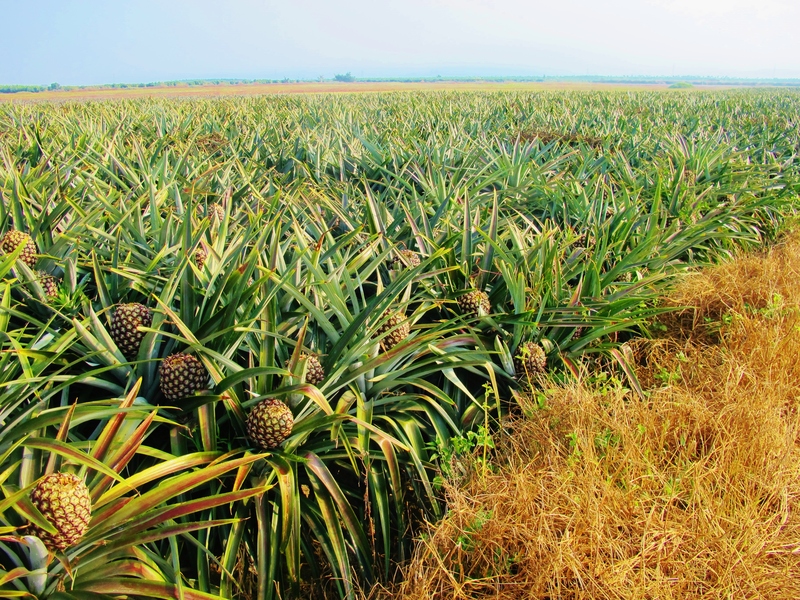 Following a very precise piece of gen from Steve – probably Taiwan’s premier bird lister – I found myself standing in the middle of a pineapple field in rural Pingtung County, early on Saturday morning. “Check the grassy path margins”, I had been told. “I never fail to see Blue-breasted Quail there, although you’re likely to get flight views only, and it may take most of the day to even get those”. Twitching quail of any kind is a risky business at best, with a low chance of success. These tiny birds are notoriously secretive, sticking to thick ground cover and almost never appearing in the open. Nonetheless, Steve’s gen turned out to be perfect. After only an hour of wandering around, I flushed a female-type quail from some long grass at the edge of a pineapple field. Its size, lack of contrasting blackish flight feathers, and sandy colored underparts with no chestnut vent, were enough to ID the bird as a Blue-breasted Quail. This is one of Taiwan’s most retiring and elusive resident birds, seemingly restricted to the far southwest of the country, and particularly partial to hiding in pineapple fields. I returned to the site the following afternoon to try for better views. This time, I was about to give up and had almost got back to my scooter when I flushed an adult male Blue-breasted Quail. This one showed rather better than yesterday’s female; its slaty-blue underparts, plain wings, and chestnut vent were all seen well as it flew past me. What a fantastic lifer, and most definitely a bonus bird that I wasn’t expecting to see in Taiwan. A strong supporting cast in the pineapple fields included a female Siberian Stonechat (Taiwan tick), and a total of six Savanna Nightjars flushed from the bare paths among the pineapples. The majority of the weekend was spent near Hengchun, in a beach house we rent on the coast there. The Oriental Stork that has been present for a couple of weeks showed well on open marshes just outside of Hengchun town – a real five-star world bird that I have only seen once before, in Korea in winter. A Purple Heron at this site was also noteworthy. Finally, I stopped off at Dapeng Bay on the way back to Kaohsiung, to grab a few more waders for the year list. Foremost among the twelve wader species seen was a Red Knot – an uncommon passage and wintering bird in Taiwan, and only my personal second or third record in this country. Overall, a fantastic weekend of birding, even though I didn’t actually spend that much time birding this weekend. Lifer: Blue-breasted Quail (total 1,793). Taiwan ticks: Oriental Stork, Siberian Stonechat (total 280). Today I came up with the vague plan of seeing 100 bird species in a single day in the Kaohsiung area. I started rather late and visited just three birding spots, before calling it a day well before sunset – but even so, managed to see 83 species. My conclusion is that 100 species in a day is perfectly possible in winter, with good weather, a little luck, and an early start. My first port of call was the east bank of the Gaoping River, a couple of kilometers north of the big Kaohsiung-Pingtung bridge. Fast-flowing sections of river here create excellent feeding grounds for ducks and waders, which gather in big flocks to intercept fish and invertebrates caught up in the fast-moving water. Huge numbers of Black-winged Stilts and Common Teal were accompanied by smaller numbers of other waders, including a Green Sandpiper at a backwater – a speciality of this site. Other regular birds here such as Lesser Coucal and Golden-headed Cisticola were not seen today, but a couple of Black-shouldered Kites provided some compensation. I then drove to Maolin, which was rather quiet compared to Sunday with no sign of the male Japanese Thrush. Birds here which I didn’t see during my last visit included two Taiwan Bamboo-Partridges, an Emerald Dove and a Black-eared Kite. Black-necklaced Scimitar-Babbler and White-bellied Erpornis also put in an appearance, showing once again how excellent this site is for both of these uncommon species. Conveniently, Highway 28 starts just a kilometer from the end of the Maolin valley, and 49km later terminates just a stone’s throw from Cheting Marshes – most useful for any birders trying to get a decent day list! Many of the usual suspects were on show at Cheting, but I failed once again to find the recently reported Ferruginous Duck, although at least three female Tufted Ducks with gleaming white undertail coverts were present. I didn’t see anything unusual here today, although a flock of 20 Chestnut-tailed Starlings in the late afternoon was an excellent count – presumably they were heading to roost somewhere in the area. I think 100 species in day would be fairly straightforward in winter if one made a dawn start at Tengjhih, spent a few hours at Maolin, a couple of hours at Cheting, then stopped off en route back to Kaohsiung for birds like Pheasant-tailed Jacana. Today was a “four gull day”, which is most unusual in Taiwan where – apart from the locally common Black-headed Gull – gulls are very scarce winter visitors. There was an adult Mongolian Gull at “Chiayi Xin Wen”, the area of lakes I refer to as Budai, which lies between Km 134.5 on Highway 17 and local road 163 to the south. Further north, a sandbar in the Puzi River – viewable through the mangroves from the top of the embankment just east of Highway 17 – was teeming with birds including three splendid winter adult Saunders Gulls and an adult Black-tailed Gull among the abundant Black-headed Gulls. I might have added a fifth species to the day list – Heuglin’s Gull – if a suspiciously dark-mantled fly-by adult larus had stopped at the sandbar for closer scrutiny. Aside from gulls, I had been informed of a Ferruginous Duck at Cheting, which was apparently photographed there “recently”. Checking the Tufted Duck flock on the eastern lake, I quickly found a female-type individual that showed obvious white undertail coverts, and a slightly warmer brown tone to the plumage than the rather cold brown normal for female Tufted Duck. The bird was sleeping, but it did briefly raise its head on several occasions to reveal a rather steep forehead and peaked crown above the eye, and no obvious tuft at the rear of the head. But somehow it just didn’t feel quite right, and given the wide range of Tufted Duck plumages (including several other female-type birds present at Cheting that also showed striking white undertail coverts), as well as the distinct possibility of hybrids, this one won’t be making it on to my Taiwan list yet. Another very notable record at “Chiayi Xin Wen” was a flock of no fewer than six Black-necked Grebes on the lake south of road 163. This must constitute a very high count for Taiwan. However, I couldn’t find the Great Crested Grebe that had been reported here a few days earlier. North of the 163, the western lake held a big flock of diving ducks consisting of 280 Tufted Duck, 16 Common Pochard, and 3 Greater Scaup (two immature males and a female) – a long-awaited personal Taiwan tick. Other notable birds seen today: Black-shouldered Kite (1 Budai), Osprey (1 Budai), Spotted Redshank (1 overhead at the Puzi River, calling loudly), Eurasian Spoonbill (2 Aogu) and Purple Heron (1 Aogu).